On April 4, 1979, a Boeing 727 with 82 passengers and a crew of 7 rolled over and plummeted from an altitude of 39,000 feet to within seconds of crashing were it not for the crew's actions to save the plane. The cause of the unexplained dive was the subject of one of the longest NTSB investigations at that time.While the crew's efforts to save TWA 841 were initially hailed as heroic, that all changed when safety inspectors found twenty-one minutes of the thirty-minute cockpit voice recorder tape blank. The captain of the flight, Harvey "Hoot" Gibson, subsequently came under suspicion for deliberately erasing the tape in an effort to hide incriminating evidence. The voice recorder was never evaluated for any deficiencies.From that moment on, the investigation was focused on the crew to the exclusion of all other evidence. It was an investigation based on rumors, innuendos, and speculation. Eventually the NTSB, despite sworn testimony to the contrary, blamed the crew for the incident by having improperly manipulated the controls; leading to the dive. This is the story of a NTSB investigation gone awry and one pilot's decade-long battle to clear his name. 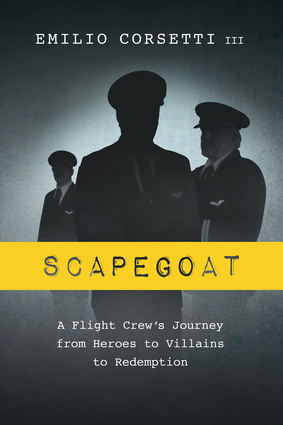 Scapegoat is published by Odyssey Publishing, LLC and distributed by Independent Publishers Group. Emilio Corsetti III is a professional pilot and author whose work has appeared in publications such as the Chicago Tribune, Multimedia Producer, and Professional Pilot magazine. He is the author of 35 Miles from Shore. He lives in Dallas, Texas.